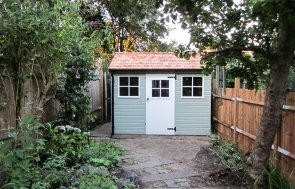 The garden shed has an apex roof covered with our heavy-duty, heat-bonded felt and guttering has been added along the fascia boards. The exterior design features stunning rustic weatherboard cladding painted in Cream and Georgian windows that open to allow for ventilation and natural light. The customer also chose to add our security pack option for extra peace of mind and enhanced safety. Our security pack consists of several features designed to further secure the building, such as ‘un-screw-able’ screws in the door hinges, a heavy-duty sliding bolt with fully-encased seven lever lock and stainless-steel window bars that are manufactured into the window frames. 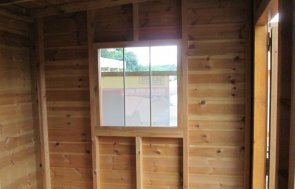 Internally, the shed is fully equipped to be the ideal workshop, with our oak-faced ply lining, an electrical pack with heater and a sturdy workbench for pursuing projects. Our electrical pack is the essential addition to make to any building that is to be used in order to pursue projects, as this enables the building to make use of light, heat and power. The pack also includes an external dual socket so that outdoor appliances such as lawnmowers and jet washers can be used easily. 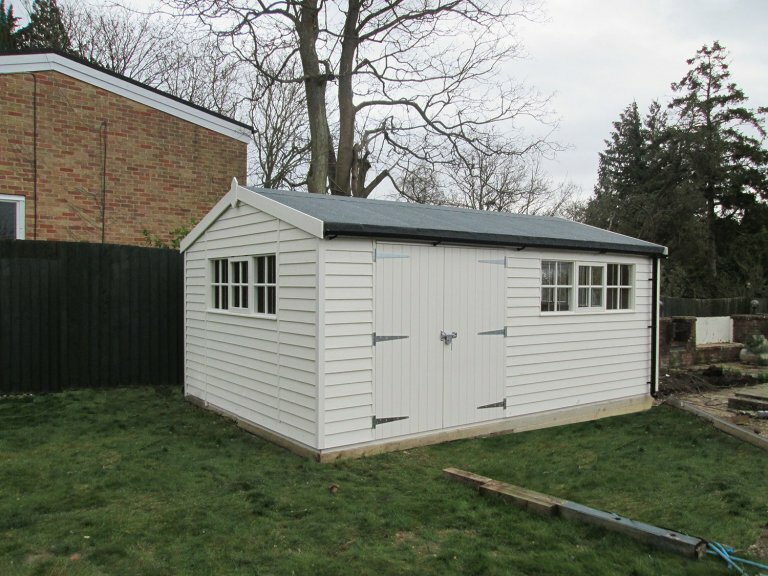 If you would like to take a look at our range of buildings, you can do so for yourself at one of our UK show centres, where there will be a variety of models on display including one similar to this building. You can locate your nearest here, or plan your visit by getting in touch with us on 01760 444229.